There are more than 300 cider apple varieties. These apples are not like the ones you buy from the supermarket, they have special strains high in acids and tannins that are unique to the West Country – Somerset, Devon and Herefordshire. Most traditional apple varieties contain a combination of all four. It’s down to the expertise of the cider makers judgement on how to blend so the final result is a balanced mix of sugars, acidity and tannins. Too much of one may result in the cider being overpowering and undrinkable. Tannin gives cider the colour, the more tannin, the deeper the golden brown. Tannin also give dryness, the same dryness in red wine that sits at the back of your tongue when tasting it. These give unique tastes and characteristics depending on the combination of apples that are pressed to make real cider. The apples also have fantastic names: Tower of Glammis, Galloway Pippin, Watson’s Dumpling, Red Cluster, Foxwhelp to name but a few! 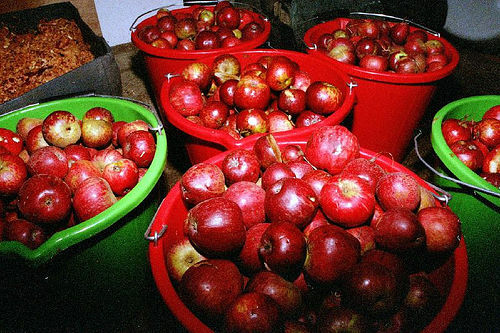 Cider makers choose their apple selection before pressing the cider apples together. Other producers press the apple types individually, then blend to taste the juices before they ferment. And some don’t even blend, they sell the cider as single varietals, for example, Kingston Black which is fermented in old rumm barrels to give a distinctive flavour and Redstreak whose production as a single has been traced back to the 18th century. Did you know: 45 per cent of all UK apples are now used to make cider – Learn more at cider facts.